40 years ago a Viking was born! 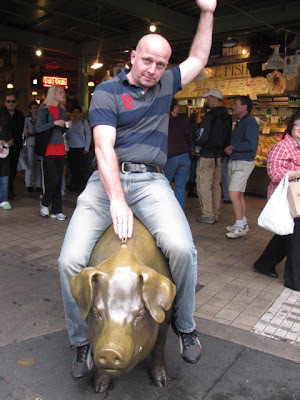 I wonder if 40 years ago, the Viking gods dreamed that this particular Viking would be spending his "rund fødselsdag" ("round" birthday) weekend riding the "lucky pig" in front of Pikes Market in Seattle, Washington, USA?! Jess and I have all sorts of good things planned for our Viking today to celebrate his 40th birthday in the US, so let the GAMES BEGIN! I bet it's going to be a crazily wonderful day!